Guests planning to visit Star Wars: Galaxy’s Edge at Disneyland park in California between May 31 and June 23, 2019 will need valid theme park admission and will be required to make a no-cost reservation, subject to availability, to access the land. Information on how to make a reservation will be available at a later date on Disneyland.com and the Disney Parks Blog. Guests staying at one of the three Disneyland Resort hotels during these dates will receive a designated reservation to access Star Wars: Galaxy’s Edge during their stay (one reservation per registered guest); valid theme park admission is required. A reservation will not be offered or required to experience Star Wars: Galaxy’s Edge at the Walt Disney World Resort at this time. And you should know that valid theme park admission to Disney’s Hollywood Studios is required to visit Star Wars: Galaxy’s Edge after its opening on August 29, 2019. Capacity is limited. Additionally, Star Wars: Galaxy’s Edge will be available during Extra Magic Hours. During Extra Magic Hours guests staying at select Walt Disney World Resort hotels can spend extra time at Disney’s Hollywood Studios enjoying select attractions. Details will also be available at a later date on Disneyworld.com and the Disney Parks Blog. To keep you updated on what’s to come leading up to the opening of Star Wars: Galaxy’s Edge, we recently launched our exclusive “Building Batuu” story series and special Star Wars page filled with great stories. Now, if you’re as excited as we are about experiencing Star Wars: Galaxy’s Edge, we have important information you should know before you go and begin your own Star Wars adventure in a galaxy far, far away. Park Admission: Regular theme park admission is required to enter Disneyland Park and Disney’s Hollywood Studios. There will not be a separate ticket for Star Wars: Galaxy’s Edge. 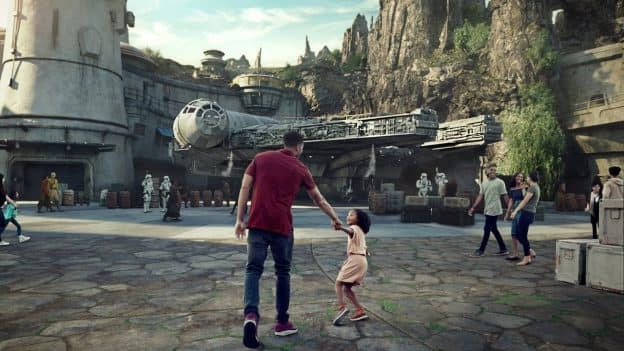 To visit Star Wars: Galaxy’s Edge at Disneyland park between May 31 and June 23, 2019, guests will need valid theme park admission and will be required to make a no-cost reservation, subject to availability, to access the land. We’ll share information on how to make a reservation at a later date on the Disney Parks Blog and on Disneyland.com. Planning: If you’re looking to book a vacation to the Disneyland Resort, visit Disneyland.com. You should also note that vacation packages, park tickets and Disney Resort hotel stays do not guarantee access to Star Wars: Galaxy’s Edge. The land —including participation in its experiences—will be subject to capacity restraints and other restrictions. Along with new Building Batuu series stories, we’ll also be sharing more information on what you need to know when planning a visit to Star Wars: Galaxy’s Edge, including arrival and planning details in upcoming posts here on the Disney Parks Blog. And while we wait for the opening of Star Wars: Galaxy’s Edge, you should also know that you can experience Star Wars in the park in a whole new way (April 4-7) during a weekend of galactic fun at Star Wars Rival Run Weekend at the Walt Disney World Resort. Learn more or register today at runDisney.com. Keep checking the Disney Parks Blog for updates on Star Wars: Galaxy’s Edge at Disneyland Resort in Southern California and Disney’s Hollywood Studios in Florida. My favorite part about this announcement is the note/warning at the bottom. It’s like: yes, we are opening. You might even have a park ticket. But will you get IN? Now THAT is the question. Ha! I have two boys who absolutely love star wars!! I was wondering what the height requirements will be for these new attractions? So excited!! I´m from Brazil and I´m going to be in Anaheim on early June (3 to 5th) with my wife. I already bought here in Brazil my 2 days non-refundable ticket to Disneyland and paid for non-refundable hotel nights (outside Disney). I was hoping the Star Wars opening would be later June, so this wouldn´t be a issue for us. For my surprise, it was announced today that it will open on May31th – and if I want to go to the park on early June (the ONLY days I have), this would depend on a reservation subject. What should I do? 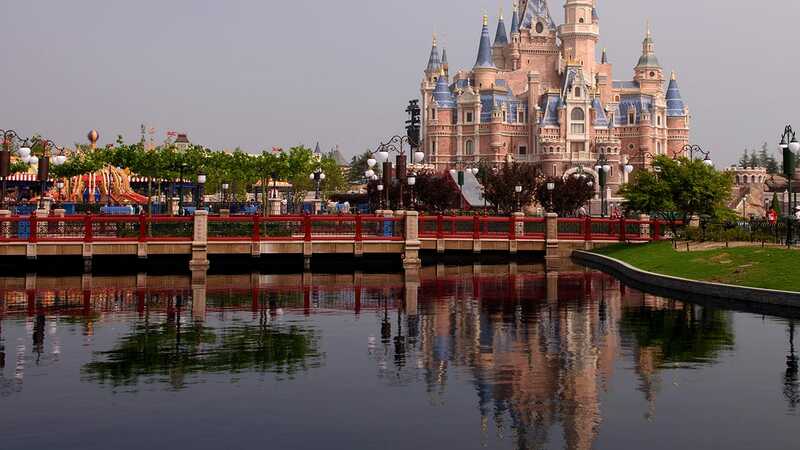 I´m desperate now, fearing I won´t be able to enjoy the much antecipated vacations in the parks we´ve been dreaming. I made and paid my reservations 9 months ago! Please, would you have some advice? No preview for annual pass holders? Daniel – From what I’ve read, the reservation is not for Disneyland. It’s for the Star Wars: Galaxy’s Edge land of Disneyland. The rest of the park should available without reservation. I do have a hotel reservation from June 2 to June 3 booked through Disney.com. So does that mean the first statement applies to me? I would assume the same attractions at Disney World in Florida would have the same requirements. Diana according to other theme park news sources, millennium falcon smugglers run will have a height requirement of 38 inches and Star wars rise of the resistance will have a height requirement of 40 inches. Also the old Star tours ride will still retain the height requirement of 40 inches obviously. So as long as your kids are 40 inches or taller they will be tall enough for everything in Star wars Galaxy’s edge. Millennium Falcon: Smugglers Run will have a height requirement of 38″. Star Wars: Rise of the Resistance will have a height requirement of 40″. Response to Tracey and Suzanne: I believe what they are saying is that outside of the window for booking a Disneyland Resort Hotel stay (5-31-19 thru 6-23-19) that there are no guarantees that entrance to SWGE is assured should capacity reach a certain amount of guests. Additionally, guests not staying in a DLR Hotel may outnumber the availability of a reservation depending on when the hotel stay is booked. Best bet… stay away from DL until we’ll after the opening. I did this for the opening of CarsLand and glad I did. IMO, anything great is worth waiting for!! Let the massive hoards fight it out, while you enjoy planning far ahead for an unforgettable DLR stay! I think this statement below is only outside of the May31-June 23 reservation dates….. If you’re looking to book a vacation to the Disneyland Resort, visit Disneyland.com. You should also note that vacation packages, park tickets and Disney Resort hotel stays do not guarantee access to Star Wars: Galaxy’s Edge. The land —including participation in its experiences—will be subject to capacity restraints and other restrictions. I’m so looking forward to my vacation in November to Disney World. I was 15 when the first Star Wars opened and have been a fan ever since. To be able to get that into that World with the technology of today will be AMAZING. I can’t wait. I understood the same later – missed the “land” part. I’ll be on the wrong coast in June as we already have a trip booked at WDW for our 10th Wedding Anniversary! I will want to experience the complete land with Rise of the Resistance anyway, so I’ll probably book a Disneyland or WDW trip for Spring Break of 2020, but it’ll be hard to wait! I’ll be watching to see if Galactic Nights comes back too; that may make it worth flying out in December. Do you think there’s any possibility of some kind of “virtual line” for Millennium Falcon ride? We have been coming in Early June for years and booked our reservation a month ago for the Disney resort. My “kids” (in their 20’s but still go to Disney with mom & dad) were excited to read Galaxy Edge is opening early adn and we’ll be there for the opening weekend. Called reservations to check on Galaxy Edge pass and they confirmed that, yes, until June 24th every person staying in a Disney resort hotel will get a pass to enter Galaxy Edge at a specific day and time during their stay and they will be letting people know soon so they can make other reservations (such as dining, etc..) around that time. Since they will be limiting how many people go into Galaxy’s edge at a time and it is only by reservation it should not have a tremendous impact on the rest of the park. You do *not* need a reservation to get into Disneyland itself, just a park ticket. It will actually be worse after June 24th since then anybody can enter Galaxy Edge. No Fastpass+ available for WDW guests. 😔 How will guests with DAS cards be able to access this? We are in WDW from 13th Aug- 29th August. Do you have any information for guests arriving after the registration period (Jun 24). Will there be magic mornings for Disney hotel guests? Will fast pass or max pass be available then? Will WDW be scheduling EMH for every morning (like they did with Toy Story) once SWGE opens? We are a family of 6 that was going to stay off property due to extremty high accommodation costs onsite once you decide to have more than 3 kids….Will the Disney Springs (non Disney) Hotels still be included in these EMHs? We can almost afford to stay there. Thanks for any info. We booked a Disneyland vacation package through AAA at a “good neighbor hotel” (not one of the 3 on property) last January for early June, 2019. Will we be able to make reservations for the new Star Wars:Galaxy’s Edge section of the park? If so when can I do this and how? I spoke to a chat representative and was told the only people guaranteed to get into StarWars Land are DisneyResort Hotel guests….that we will be given a reservation for the land upon checkin. And thats the most they know at this point. I’ll be there opening day! You only need a reservation to enter the Star Wars area of Disneyland. The rest of the Park will be open as scheduled. It is confusing isn’t it? Actually both are true. Hotel Guests will get a reservation, but just having that reservation doesn’t necessarily mean you’ll get inside the area. There are many reasons that might happen – too crowded when it’s your entry time (people just aren’t leaving the area), mechanical issues, acts of nature, etc.